(Nanowerk Spotlight) Analyzing the physicochemical processes that take place at surfaces and interfaces is an important aspect in materials science, catalysis, biochemistry and other fields. For many years, surface scientists who wanted to probe microscopically and analytically the interfaces between liquids and solid surfaces, or simply liquids, have relied on powerful tools like X-ray Photoelectron Spectroscopy (XPS) and other spectroscopy techniques based on the detection of electrons. XPS reveals the elemental composition and chemical and electronic states of surfaces by irradiating a material with a beam of X-rays and measuring the energy and electrons that escape. "However, it still remains a great experimental challenge to adapt powerful, surface sensitive tools such as XPS or – the action of which is based on the detection of emitted electrons with relatively low kinetic energy – to explore objects at ambient conditions," Andrei Kolmakov, an associate professor in the physics department at Southern Illinois University at Carbondale, tells Nanowerk. "This is mainly due to the short moderate energy electron inelastic mean free path in dense media, which is of the order of a nanometer in condensed matter and 1 micrometer in gases at atmospheric pressure." As Kolmakov explains, the environmental XPS has been implemented around twenty years ago using rather complicated, expensive equipment which was aimed at effectively reducing the pressure along the pass from the sample to the detector via the set of small apertures and multiple pumping stages. Due to the complexity and uniqueness of this equipment – there is only a limited number of these instruments installed around the world – it could be challenging for researchers to get sufficient experimental time on these instruments. Furthermore, working with XPS results in extremely challenging experiments since it requires ultrahigh vacuum for electrons to travel and be detected – a condition that is at odds with the elevated vapor pressure of most liquids (i.e. water). Writing in Nature Nanotechnology, Kolmakov and colleagues from Northwestern University (led by Prof. Jiaxing Huang and Dr. Dmitriy Dikin), Sincrotrone Trieste (led by Dr. Maya Kiskinova and and Dr. Luca Grigoratti) and TU Munich (Prof. Sebastian Guenther) report a simpler approach to atmospheric-pressure XPS ("Graphene oxide windows for in situ environmental cell photoelectron spectroscopy"). In this work, they demonstrate that graphene oxide (GO) membranes are a very promising window material for environmental cells to enable XPS studies of samples immersed in liquid or dense gaseous media. 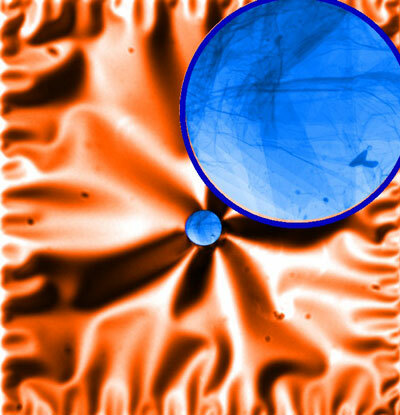 The key to this technique is an environmental cell window made of a nanometer-thick GO membrane that is both thin enough to allow X-rays to enter and photoelectrons to exit, and strong enough to sustain a full atmosphere of pressure difference. "Our – relatively simple – solution lies in separating the volume of the liquid sample (elevated pressure) and volume of spectrometer (detector) with a gas-impenetrable but electron-transparent ultrathin membrane" explains Kolmakov. "This approach only become possible after the discovery of graphene and its derivatives which are atomically thin but mechanically robust. Benefiting from the effective protocols of fabrication and handling of graphene oxide we used this material for our windows." The team's proof-of-concept experiments showed that up to several layers suspended GO membranes have sufficient transparency for photo-emitted electrons with kinetic energies >450?500 eV. As they write in their paper, they obtained good quality XPS spectra from aqueous solutions and nanoparticles deposited on the back side of the GO membranes. A major challenge for the researchers was to ensure the mechanical stability of the graphene membrane. The window is only few monolayers thin and yet it has to survive a pressure difference of one atmosphere. They overcame this by fabricating windows that are only a few microns in diameter (they used a focused ion beam to drill 3-10 µm holes in primary silicon nitride membranes and then deposit GO single sheets over these holes). Kolmakov points out that, different from the 'traditional' environmental XPS, his team's approach can be used with any commercial micro-XPS instrument. In addition, such environmental cells can be used routinely with any scanning or transmission electron microscopes. "From the broader application prospective, ultra-transparent and robust graphene/GO windows open the door to unprecedented opportunities for in situ electron spectroscopy in operando conditions," he says. "In contrast to the current environmental XPS methodology, which relies on stationary sophisticated instrumentation associated with synchrotron radiation sources, these low-cost single-use E-cells can potentially be used with any commercial micro-XPS or Auger electron spectroscopy instrument, routine SEM/TEM or optical microscopes."